A highly personal account and set of opinions of famous early gardens and gardeners, designers, plant hunters, breeders and writers — a nice wide range of the people who have shaped how the UK thinks about gardens and the plants available to fill them. It serves as a good introduction in some ways, and I don’t regret the pound spent on rescuing it from an outside box at Haye-on-Wye. It is quite a superficial account, however, and its immense admiration of the aristocracy and support of England’s ambitions and practices of empire are just so problematic — it was first published in 1957. Yet very instructive of a certain mindset, so I almost gave this three stars. Maximowizc, Hance and their friends for long worked under impossibly restrictive conditions. Most of China was in a wild, lawless state at the mercy of petty chieftains. The inefficient central government, instead of carrying out the terms of its treaties with the European trading states, was awkward and obstructive. At last Britain and France sent an army. The Chinese forces collapsed and in 1860 a new treaty was made. Maximowizc and Hance must have been overjoyed at the terms. Foreigners were now to be allowed much greater freedom of movement in the interior. The European consular services were strengthened. Religious missions were permitted to increase their work and members, while an organisation, the Imperial Maritime Customs, was set up under an Englishman, Sir Robert Hart. All this meant that more men would come into China who could be pressed into service as collectors — apart from others who might collect and botanise independently’ (185). At last Britain and France sent an army? What? They are well into their project of conquest, and Hadfield is here referring to the 2nd Opium War, fought by Britain to force the Chinese government to legalise opium, promote the exportation of ‘coolie’ labour and force open the entire country to British trade. An undertaking that makes me literally shake with anger, and gives context for an ‘awkward’ and ‘obstructive’ government. There are a few stories such as that of collector and missionary-botanist was Father Jean Andre Soulié, who apparently ‘helped by high cheek-bones’ was able to travel disguised as a native, tricking all those gullible people thirsting for European blood in the pursuit of scientific knowledge. Right. He was killed by Tibetens during an uprising. 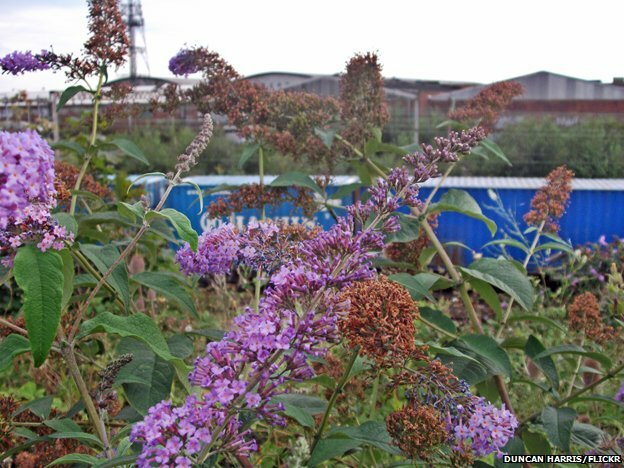 Interestingly, he is also the introducer of the Buddleia davidii or butterfly bush, that is beautiful and wonderful for butterflies and bees, but has since become an invasive species which you can see lodged everywhere in UK buildings and along railroad tracks as it thrives on lime and sends mortar crumbling into dust. There is a fact sheet on the history of its invasion here. There is not a thought in this book for ecosystems, or the dangers of introducing foreign species into new environments. I suppose that is a new ‘discovery’ Europeans have made. This is primarily a story of men, and where women enter into it, it is in their role as assistants. Jane Webb for example, an early pioneer of Science Fiction and author of The Mummy, is described thus: ‘Indeed, Jane Webb, the high-spirited girl, disappears to become Mrs. Loudon, the most capable assistant of Mr Loudon… (162)’ though it does go on to acknowledge her work as a writer on popular gardening. Still. She was at least his equal. William Kent, Launcelot Brown and Humphry Repton, we can feel certain, were turning in their graves, their spirits distraught by the lack of taste shown by the Victorian gardener. For one thing, the pendulum again swung right over to the other side: colour, and garish colour at that, came into full favour once more. While the study of nature–and, of course, plants–on scientific lines progressed by leaps and bounds, “nature” is the sense understood by all the gardeners from Kent to Loudon went right out of fashion. First of all we must blame the new school of practical gardeners; these men were exceedingly skillful at cultivating plants. And next we must accuse the greenhouse…Their cost fell considerably, and a whole new class of society–and a class with neither tradition nor very refined tastes–could now own them. He goes on to rail against the ‘bedding out’ of plants, their strange and extravagant results and etc. John Claudius Loudon – from Cambuslang! pioneered the modern agricultural college, made the interesting decision to undertake a foreign tour through Europe at the end of the Napoleonic Wars, produced Encyclopaedia of Gardening updating Miller’s Dictionary and launched The Gardener’s Magazine. Improved and designed Kensington Gardens. Joseph Paxton – gardener at Chatsworth, builder of greenhouses leading to his design of Crystal Palace.